Za’atar Roasted Pineapple & Salmon Salad. Photo by Adeena Sussman. Even the most dedicated cook needs a break from the stove, and summer’s start is the right time to take one. As the weather heats up, the less time logged in the kitchen the better. Generating as little heat as possible is the goal, and that is where a little investment up front pays off big time on the back end. The concept is simple: Cook once, eat multiple times. A luscious side of salmon is a more than agreeable starting point. But before you run from the room thinking, “Salmon? Again?” bear with me. First, buying the very best salmon you can find, preferably wild, reaps great flavor dividends. The flesh is firm and meaty, and it is full of healthy Omega 3 oils. True, the fish does not come cheap. But a single 3-pound filet yields enough for 8 to 10 people, either at one sitting or stretched over several days, making it a veritable bargain. Slathered with lemon, herbs and olive oil and roasted for 20 minutes, this simple Herb Roasted Salmon recipe is the cornerstone of not one meal, but four. Pull the salmon out of the oven and slice off a filet for lunch or dinner. Then, the fun starts. Use the leftovers to create one or more of these simple recipes, all of which are a snap to put together in a short time. In the refreshing salad, pineapple chunks are tossed in savory za’atar and roasted until caramelized, their sweet acidity a counterbalance to the salmon’s richness. A salmon dip infused with smoked paprika and sherry vinegar makes a great party starter, cool and creamy with just the right amounts of exotic and familiar. Finally, a club-style salmon, avocado and “bacon” sandwich is classic Americana at its best, easy and tasty. Makes 8, 5-oz salmon filets or 8 cups flaked salmon. Preheat oven to 350°F. Combine olive oil, lemon juice and zest, salt, thyme, oregano and pepper and rub all over salmon. Place on a parchment-lined baking sheet and roast, skin-side down, until salmon is just cooked through, 18-20 minutes. Remove from oven and cool. Slice into filets or flake and reserve in an airtight container for use in the following recipes. 1. Preheat oven to 400°F. Toss pineapple and za’atar in a bowl; roast in a single layer on a parchment-lined baking sheet until lightly caramelized, 25 minutes. Remove from oven; cool 10 minutes. 2. Gently toss roasted pineapple with salmon, pepper and scallions. 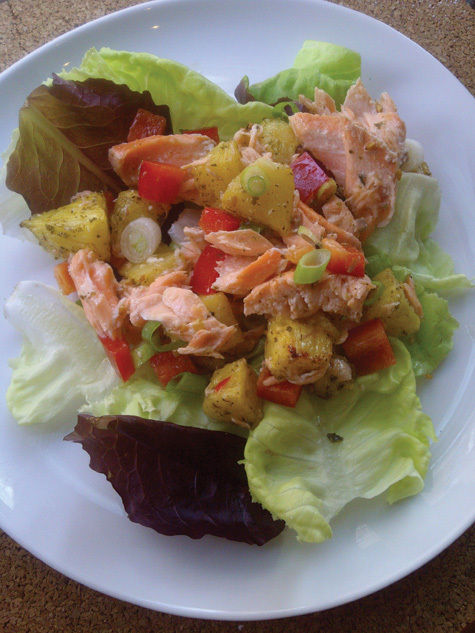 Divide lettuce among 4 plates and top each plate with 1 1/4 cups salmon salad. 3. Whisk lemon juice, olive oil, salt and pepper; drizzle over salad. 1. Pulse almonds in a food processor until finely chopped, 10-15 pulses. Add all remaining ingredients and pulse until combined but not completely smooth, 10-15 pulses. 2. Chill, then serve with crackers or as a sandwich spread. 1. Whisk mayonnaise, mustard, salt and pepper in a small bowl; spread 1 TB of mixture on each bread slice. 2. Top one slice of bread with 2 lettuce leaves, 2 vegetarian bacon strips, 1 tomato slice, 1 salmon filet and 1/4 of the avocado slices. Top with another slice of prepared bread, skewer each side with frilled toothpicks and cut in half; repeat with remaining ingredients.